NewsLifeMedia this week announced the winners of the 2016 Delicious Produce Awards, with Tasmanian distiller Peter Bignell of Belgrove Distillery taking home a major award. Sixteen awards were presented in total, including three new awards, In the Bottle, which celebrates Australia’s artisan drink makers. “This award celebrates wonderfully drinkable, premium products that are hand-crafted, and made with diligence and care. Distiller Peter Bignell of Belgrove Distillery is one of the world’s few paddock-to-bottle distillers, but that’s only part of his remarkable story,” says Mike Bennie, delicious. magazine contributor. Spoil your dad this Father’s Day at Redlands Distillery. Tours, tastings and a special menu including; whisky chocolate scones, share platters and gourmet sausages. 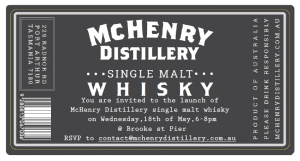 The Tasmanian Whisky Producers Association (TWPA) is set to release a highly anticipated limited bottling. The Tasmanian Collection is a collaboration of leading Tasmanian distilleries to create an exceptional and unprecedented whisky blended from the participating distilleries’ whiskies. Much awaited Barrel 3 to be release for Spring. Aged in 100L American Oak – Maker’s Mark barrels and then finished in 20L Tokay. Tas Whisky Week has kicked off!!! The inaugural Tasmanian Whisky Week takes place from Friday July 22 to Sunday July 31, 2016, with industry events being held across 9 days in Tasmanian distilleries, bars, barns, stables, restaurants and hotels. Tasmanian distilleries are opening their doors to host behind-the-scenes public tours to meet the distillers in person, provide access to unreleased whiskies, and offer dining opportunities to showcase their award winning products. Be sure to book early, as there are limited tickets available! The Limited Release Whisky we have all been waiting for is now available on the Lark Distillery website. In March 2015 Bill Lark was inducted into the Whisky Hall of Fame. The Whisky Hall of Fame is a permanent tribute to those who have made a lasting contribution to the world of whisky. Known internationally as “the Godfather of Australian Whisky”, Bill Lark was the seventh person outside of Scotland or Ireland to be inducted, and the first distiller in the southern hemisphere to be recognised. For this particular release, Bill hand-selected a 200 litre Heaven Hill Bourbon cask from Kentucky filled with Lark single malt and chose to finish it in a 90 year old Seppeltsfield Para Port Cask. He decided to bottle this straight from the barrel, unfiltered, at natural cask strength. With only 220 bottles available, this collector’s edition whisky, like Bill Lark, is one of a kind.